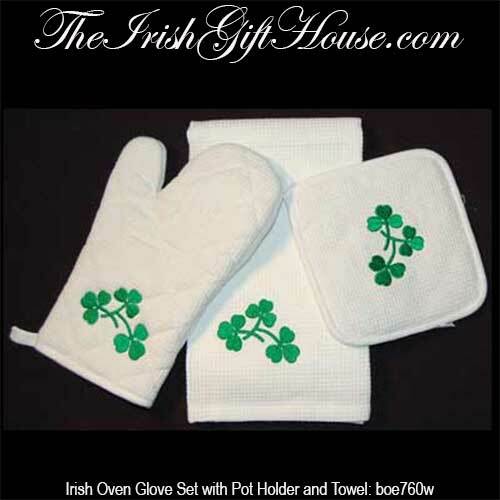 This Irish kitchen set includes a shamrock enhanced oven glove along with a towel and pot holder. This Irish oven glove set is made of heavy weight cotton! This 3 piece Irish kitchen set with shamrocks features an oven glove, a kitchen towel and a pot holder. They are white with embroidered green shamrocks and measure: towel is 18” x 30”, pot holder is 7” x 7”, and the Insulated glove is 10” long. A shamrock history card is included, complements of The Irish Gift House.